This page contains basic information about boules, information about what to buy and where to buy it, and recommendations for new and beginning players. Most discussions will tell you that there are two basic categories of boules — leisure and competition. But the situation is a little more interesting than that. Leisure boules are inexpensive boules meant for occasional or casual play. They may be called leisure (French: loisir), recreational, weekend, generic, or DOG boules. (DOG boules were one of Obut’s earliest models of leisure boules.) They are available in only one weight and size and with a bright chrome finish. They are made of thinner steel than competition boules, and are usually filled with sand or dirt to bring them up to the proper weight. Most inexpensive leisure boules are made in China. As of 2017, a set of three Chinese-made leisure boules will typically cost around $30 plus shipping. The French company OBUT makes leisure boules of a higher quality and and a bigger price tag (three or four times that of Chinese leisure boules). Chinese leisure boules tend to run in the range of about 73mm in diameter, with a weight around 720g. The current (as of 2017) line of OBUT stainless-steel (inox) leisure boules are about 73mm in diameter and weight around 650g. Competition boules are boules designed for serious competition play. More precisely, they are boules that have been certified (homologuées) by the International Petanque Federation (FIPJP) for use in FIPJP-sanctioned tournaments. Competition boules must meet FIPJP standards, and are always hollow (i.e. never filled with anything). They are available in a variety of sizes, weights, hardnesses, and striation patterns. Competition boules are between 70.5-80 mm in diameter, and 650-800 grams in weight. Competition boules are made of thicker and stronger steel than leisure boules, and they are more carefully machined so they will be more consistent in size, weight, and balance. They are also significantly more expensive than leisure boules. That’s why, when you’re starting out and learning the game, you should use a set of (cheaper, but still quite functional) leisure boules. Later, if you find yourself getting better and playing more often, you can upgrade to a set of competition boules. A set of three competition boules will, depending on what you purchase, cost from $100 up to two or three hundred dollars. For adults, the smallest legal size of competition boules is 70.5mm. 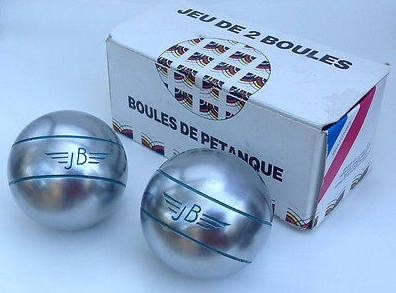 For many years, JB Petanque sold 70.5mm boules under the label Compét. Junior. Obut retired the line when it acquired JB, and it now offers 70.5mm boules as just another size in the regular lineup of sizes for its Match IT model. For more information, see our page on leisure boules vs. competition boules. Junior competition boules — When playing in junior tournaments, children age 11 and younger may use “junior” competition boules (65mm diameter, 600g weight). Obut’s line of Match Minimes is available from Petanque America. Note that these ARE competition boules, but not for adult players; only for kids 11 and under. Junior leisure boules — Confusingly, Obut also makes a set of “junior leisure” boules (junior loisir or junior initiation or initiation enfant). 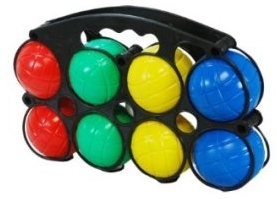 These are leisure boules, in a smaller size suitable for children. Note that these are NOT competition boules for either adults or children. Boules for indoor play — There are a variety of types of soft petanque boules for indoor play. They aren’t real boules, but they aren’t quite toys either. For more information, see our page on indoor petanque boules. 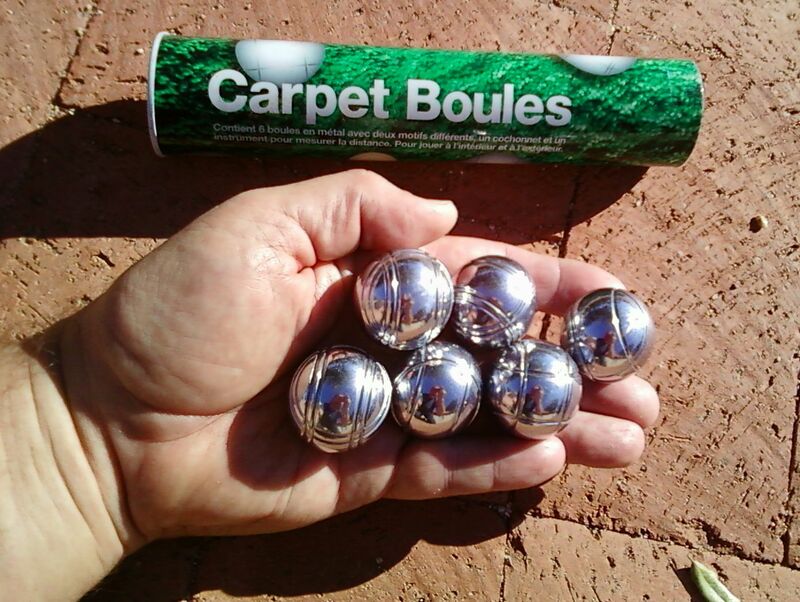 Mini boules are 35mm metal balls typically sold as “carpet boules” or mini bocce/ petanque boules. In France they are called jeu de boules d’intérieur. They look like real boules, but are about half the diameter. We keep a set so that the toddlers can play with boules that look like what the big people are using. Boule-like toys — sets of plastic or wooden balls aren’t real boules. They can be fun for the kids, or for playing not-too-serious games at the beach. For more information, google “beach bocce ball”. Boules are available from various sellers in sets of two, three, four, six, or eight boules. You have to be careful about what you’re buying. You should buy boules only in sets of 3 or 6 boules. And even then, you have to watch out for the striations (stripes) on the balls — see the discussion of the Jacques of London leisure boules (below). In the past, sets of two boules in a leather carrying case were traditional for playing triples in the south of France. That’s why you frequently see old sets of this type on eBay. Do not buy such sets. To be able to play doubles you will need a set of three boules. That’s why today manufacturers sell competition boules only in sets of three. You may see “petanque” or “bocce/petanque” balls being sold in sets of four or eight. Such sets typically contain 2 or 4 sets of two boules each. Do not buy such sets. None of the standard forms of petanque can be played with that combination of boules. Be careful even with boules being sold in a set of six, such as the sets by boules by Jacques of London, L.L. Bean, and the Canadian vendor Marcod. These sets don’t contain 2 sets of three boules each — they contain 3 sets of two boules each. Do not buy such sets. None of the standard forms of petanque can be played with that combination of boules. Never buy a set of boules that comes in a wooden or metal box. In the fantasy life of people who don’t really play petanque, the box conveys an aura of expense, quality, and elegance. (That’s what allows a vendor to jack up the price of a set of cheap leisure boules.) In real life, the box is useless. Save your money for a good set of competition boules. Proper petanque boules are sold only in sets of 3 or 6 boules — that is, as one or two sets of 3 boules each. 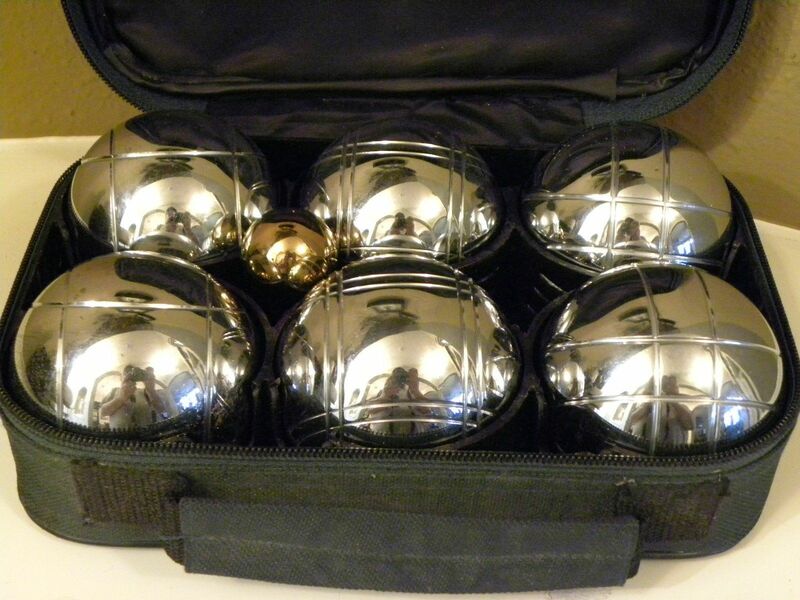 The picture at the right is of a set of 6 petanque leisure boules available from the Petanque America online store. Such a set is enough to equip two people to play doubles or triples. Before 2018 there were no brick-and-mortar stores in the United States where you could walk in and try out boules the way you might try on shoes in a shoe store. In 2018, the French mega-chain of sporting goods stores, Decathlon, opened a store in San Francisco where you can purchase a limited range of boules. For most players in Canada and the USA, however, to purchase boules, you must use an online, web-based vendor. Petanque America is the only USA-based vendor that sells boules made by Obut, the world’s largest manufacturer of petanque boules. If you want a set of boules from some other manufacturer, they can special order it for you. 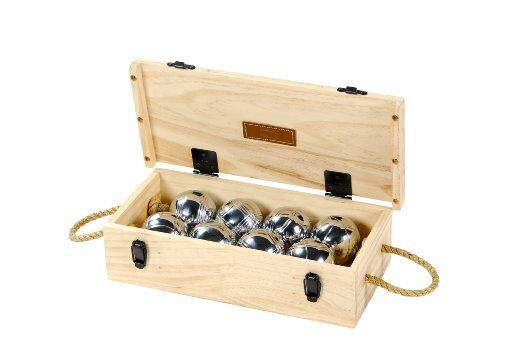 PA also sells other petanque equipment and relatively high-quality leisure boules at a reasonable price. The Decathlon store in San Francisco sells a limited range of low-cost competition boules. It also sells reasonably-priced circles and jacks. PlayABoule now sells only bocce equipment; it no longer sells petanque leisure boules. You can buy petanque boules on Amazon.com. Note however that almost all of the sets of petanque boules offered on Amazon (except sets sold by Petanque America) contain contain two, three, or four pairs of 2 boules. In addition, some boules (like those from Kikkerland) come in two sizes. The “large” size is 73mm, the standard size for a leisure boule. The “small” size is for “mini” balls (see above). Marcod, in Canada, is a reliable online vendor of Obut competition boules. They also sell leisure boules, but be careful. Almost all of their sets of leisure boules are sets of two or three pairs of boules, which we think is a bad idea (see above). It is possible to order directly from French manufacturers and suppliers, but shipping costs from France are extremely high. For special requests, you’re probably better off contacting Petanque America and seeing if they can special-order the specific boules that you are seeking. eBay is generally not a good source for boules. It is very difficult to tell exactly what is being offered — in many cases the sellers themselves don’t know. Most boules that you find on eBay America are not certified competition quality. And remember that we recommend that you not purchase sets of two boules. Watch out for the seller location— French sellers sometimes have listings on eBay America, and shipping costs from France to the USA can be ruinous. It’s fun to look for boules on eBay France. But be warned, shipping costs from France to the USA can be ruinous. Unless you’re made of money, you’re better off shopping first at Petanque America. If you’re in the mood to look for old boules, it can also be fun to look for boules on etsy. You shouldn’t spend a lot of money on boules before you’ve had time to really get a feel for the game. 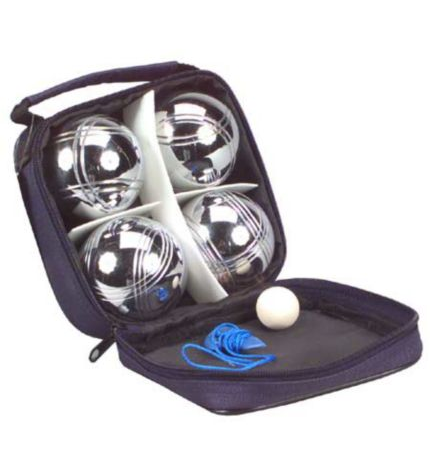 So for your first set of boules, we recommend Petanque America’s set of six leisure boules. One set of six boules will equip two players. A cost-effective approach is to buy TWO sets of six boules each. That will be enough (12 boules) to equip four people to play doubles. Two such sets can fit into one “If it fits, it ships” box, keeping shipping costs to a minimum. As of October 2018, that will be a one-time cost of around $75 (includes shipping). one set of 3 boules (single-groove narrow). When you order your boules, think about adding a couple of Obut jacks to your order. Your set of boules will include a jack, but the Obut jacks are noticeably better, and there is no extra shipping charge if you add a few to your order. Pick the color that you think will be most visible; we recommend orange or yellow. There are a number of reasons why more advanced players purchase competition boules. (A) Competition boules offer greater consistency of balance, weight and size within a set than leisure boules do. (B) You have a larger selection of choices of size, weight, groove patterns, materials, anti-rebound technology, etc. (C) You want to play in an FPUSA- or FIPJP-sanctioned competition. (D) You plan to play in Europe, where players and clubs tend to be a bit more judgmental about these things than we are in the USA. We formerly recommended La Franc SM boules as a beginning competition boule, because of their relatively low cost. Unfortunately, because of recurring shipping problems on the part of La Franc, Petanque America no longer carries La Franc boules. Now your your best options are the Obut “Match” line of boules from Petanque America, and Geologic ALPHA boules. Alphas are inexpensive (for competition boules) but you have limited or no choices of material, hardness,weight, and size. “Match” are good competition boules at a reasonable price, and they offer a good set of choices for size, weight, etc. In selecting a model you are selecting material (basically stainless steel or carbon steel) and hardness. Once you’ve selected a model, you will be asked to specify a size, a weight, and a striation pattern. Both carbon steel and stainless steel (inox) make fine boules. If you live in a hot, humid climate, or if you put your boules into long-term storage, you will need to take steps to protect carbon steel boules from rust, but rust is not normally a day-to-day issue even with carbon steel boules. We recommend a weight of 680g if it is available. 700g boules are often more easily available and they work well too. Striation patterns are a matter of taste. If you’re ordering a set of boules as a gift for someone, and want to make it something nice without breaking the bank, a set of Geologic ALPHA boules or a set of Obut stainless-steel leisure boules would be a good choice. The Obut leisure boules (picture HERE) are high-quality stainless-steel leisure boules (which means that they can NOT be picked up with a magnetic boule lifter). Geologic Alphas are actually competition boules, and actually might be a bit cheaper than the Obut leisure boules. A set of 72mm Alphas would be a good choice for a player with smaller hands. By the way, a nice gift for a player who already has it all (or almost all) is a folding umpire’s ruler. This kind of ruler is by far the best way to make measurements in petanque, but most players do not have one. You can see some pictures HERE. It is possible to buy competition grade boules on eBay as long as one knows what questions to ask the seller. It is a requirement of FIPJP that competition boules have the trademark of the manufacturer and the weight (in grams) engraved on them, and although it is not officially required, the manufacturers also add a distinctive serial number (same numbers on each boule set) and some brands even have the diameter engraved on them. Knowing this, one could ask the seller to describe the markings on the boules and obviously, even if the seller does not really knows what he is selling…..You do!! PS: If you are not familiar with which trademarks are officially approved by the FIPJP (not all are) ask a knowledgeable friend or visit the FIPJP’s webpage to find a list of approved boules. In the US and Canada, the only way to buy competition boules is to buy them online. In Canada, Marcod (http://marcod.com) is a good source of Obut boules. 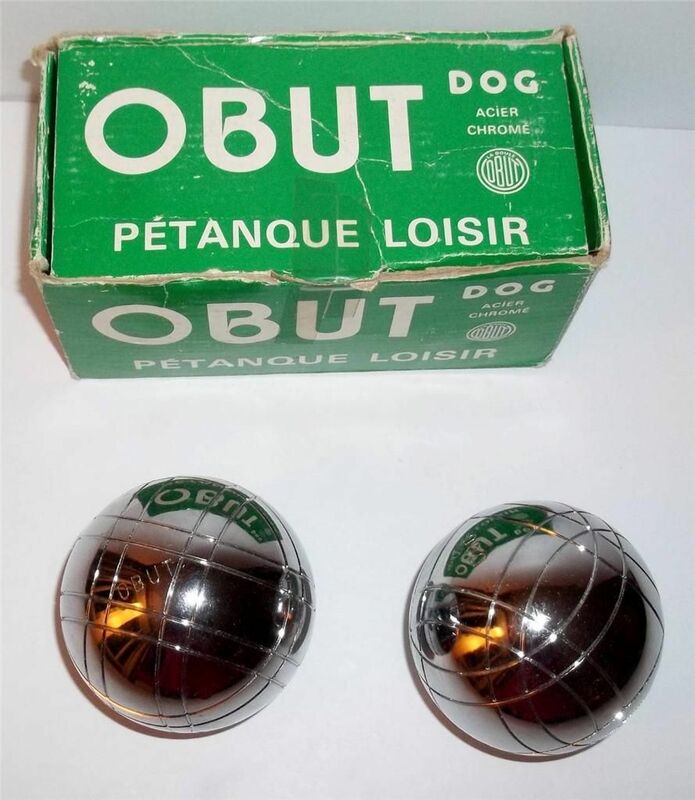 If you shop online, you might consider getting a set of Obut leisure boules. The Obut leisure boules are much better than the Chinese-made ones. They cost more, of course, but they’re also considerably cheaper than a set of Obut competition boules. If you MUST buy from a store in Toronto, then Canadian Tire stores sell a set of 4 leisure boules for about CAN$ 40. Or you can visit http://www.canadiantire.ca/en/ and search for “petanque”. Canadian vendors often sell sets consisting of one or more pairs of boules. I don’t know why— you can’t play singles or doubles with such sets. But they may meet your particular needs. Hi, thanks for your informative site! I found it incredibly useful while researching two sets of JB boules. I noticed you warn against buying boules in sets of two. Was there a time when quality manufacturers sold them? The sets I have are boxed, so I know they were originally sold as a set of two, but they seem to be very high quality. There are no dates on the boxes, but the graphics suggest ’70s or ’80s to me. Is there a date or decade when sets of three became standard? Thanks! JB was a good company. In fact, Jean Blanc was the one who, in the late 1920’s, invented the now-standard manufacturing process for boules — stamping steel blanks into hemispheres, and then welding the hemispheres together to create a hollow sphere. JB Petanque is gone now. The company was acquired by Obut, and the “JB” line was discontinued. Before 1959, a standard petanque game was a game of triples, with each player using two boules. And it was standard practice for manufacturers to sell boules in sets of two. It was only with the 1959 revision of the rules that singles and doubles were officially recognized, and even then (1959) the number of boules per player in singles or doubles wasn’t specified. By 1984, the standard configurations of boules for singles (3 boules per player), doubles (3 boules), and triples (2 boules) had become part of the rules. Manufacturers continued to sell boules in sets of both two and three, but as doubles became more popular, the market for 2-boule sets gradually declined. Finally, around 2012 Obut stopped selling competition boules in sets of two. I was visiting eBay and saw your two sets. They look to me like JB leisure boules of a fairly recent vintage. The word “Entrainement” on the box is a clue, as is the fact that the logo is painted… something that you won’t see on competition boules. The starting bid of $19.99 strikes me as just about right. Is it possible to buy hollow plastic boules that can be filled with water or sand to increase their weight? I find that my traditional metal boules are too heavy to take on a plane to remote countries. I don’t think so. There are plastic, water-filled boules on the market (see for example THESE). But they are completely sealed, and there is no way that they can be emptied and refilled at will. There is no way to make a cover or cap or seal that would be effective, easy to use, and could also withstand the punishment of being thrown around and hit by other balls. Just to confirm my understanding of the rules regarding competition boules and during tournaments. A set of boules (3 balls) must meet the FIPJP criteria BUT can all 3 boules be of DIFFERENT manufacturer, weights, hardness and striation patterns ? For example – 1st boule can be plain, soft for shooting (say made by Obut), 2nd boule can be a pointer/shooting (Geologic Alpha) and the 3rd boule is a pointer ball (La Franc). All 3 boules individually meet the FIPJP requirements. Playing with colored boules is allowed in the Netherlands. I’m one of the organizers of the international tournament Batavia Petanque (14th edition) and both finals (triples and doubles) will be played with colored boules (grafitty bombs, red and blue). Mag ik mijn boules markeren met een stift of verven? Aan boules mag volgens artikel 2 niets worden veranderd. Trucage kan méér kan inhouden dan alleen maar thermische of mechanische bewerkingen van het ijzer: ook verven of beïnkten vallen hieronder als daardoor de eigenschappen van een boule veranderen. Zo kan een boule er stroever door worden. Overeenkomstig artikel 16 alinea 5 dient een boule, alvorens deze wordt geworpen, te worden ontdaan van alles wat eraan kleeft. Dit betreft niet alleen modder en blaadjes, maar ook verf, inkt en dergelijke. In toenemende mate ontstaat uit het oogpunt van publieksvriendelijkheid belangstelling voor het spelen met gekleurde boules. Als in de nabije toekomst gekleurde boules af fabriek worden geleverd die door de FIPJP worden goedgekeurd, zijn die vanzelfsprekend ook hier toegestaan. Ook bestaat er voor onderlinge wedstrijden en voor kleinere toernooien (regionaal) geen overwegend be-zwaar tegen het aanbrengen van een bescheiden markering op boules (bijvoorbeeld met een markeringsstift enkele puntjes of een streepje zetten, of een deel van de striage inkleuren), mits de eigenschappen van de boule er niet door veranderen. De scheidsrechter beoordeelt of deze markering kan worden toegestaan. Can I mark my boules with a marker or paint? According to article 2, nothing about boules may be changed. Tampering with a boule may involve more than just heating or mechanical operations on the iron. It may also involve painting and inking. Applying a coat of paint or ink can affect the properties of a boule. For example, a boule may be rougher [to provide a better grip?]. According to article 16, paragraph 5, anything adhering to a boule must be stripped off before the boule is thrown. This includes not only mud and leaves, but also paints, inks and the like. In the past, paint was used to hide holes that had been drilled in boules, in order to tamper with the boules. For that reason the FIPJP explicitly prohibits use of paint and the like. [2010 version] Occasionally, especially during big tournaments, the competition organizer may require boules to be colored in order to improve their visibility to the viewing public. In such cases, in order to avoid the kind of abuse of paint described above, the coloring of the boules will be done by the competition organizer. This is technically incorrect, but it is tolerated for the sake of promoting the sport. [2016 version] There is an increasing interest in playing with colored boules in order to make it easier for spectators (the viewing public) to follow the game. If in the future manufacturers produce colored boules (boules colored at the factory), and those boules are approved by the FIPJP, they are obviously permitted here too. For friendly(mutual?) games and smaller (regional) tournaments, a modest amount of marking may be applied to boules (for example, using a marker to add colored dots or dashes to the striage lines), provided that doing so does not change the playing properties of the boule. That does not seem to me to allow for colored boules in an international tournament. Note that the paragraph that said that competition organizers could provide colored boules was in the commentary on the 2010 rules. It was removed and replaced in the commentary on the 2016 rules. Also: Can you provide a good English translation for “Zo kan een boule er stroever door worden.”? I can’t get anything out of Bing or Google Translate that makes sense. We should be careful of our wording here. Just describing a boule as “colored” isn’t enough. The pre-2016 interpretations of the Dutch rules allowed the use of colored boules if and only if the boules were not colored before the competition, and were then colored by the competition organizer. In a high-level competition, a player would never be allowed to use boules that he had colored himself. Correct? You are right that the Dutch commentary says that colored boules are not allowed. But, it’s just the commentary on the rules and not the rule themselves! We follow the explanation of Mike Pegg, international umpire and also member of the FIPJP rules commission, who says that colored boules are allowed. So, the Dutch rules commission is wrong and I told that to them many times!